Gregory Law Group, PLLC has over 80 years of combined experience working inside the IRS as Former IRS Attorneys and Former Revenue Officers. Gregory Law Group, PLLC is a boutique law firm located in Addison, Texas (by appointment only). The firm’s areas of practice include income tax, international tax, corporate and partnership tax, and business and estate tax planning. The firm represents individuals and businesses before the Internal Revenue Service on domestic and international tax issues in all phases of the audit, appeals, and collection processes. The firm represents taxpayers before the United States Tax Court. Our founders, Garrett and Deborah Gregory, worked as Senior Tax Attorneys for the IRS’ Office of Chief Counsel for over 24 years combined in Washington, D.C. and Dallas, Texas. They both served on the International Field Counsel. Mrs. Gregory was the FBAR Coordinator for Area 4 (Chief Counsel) and Mr. Gregory worked at the National Office Headquarters of Chief Counsel in the International Tax Group, Branch 5 (Financial Institutions and Products). 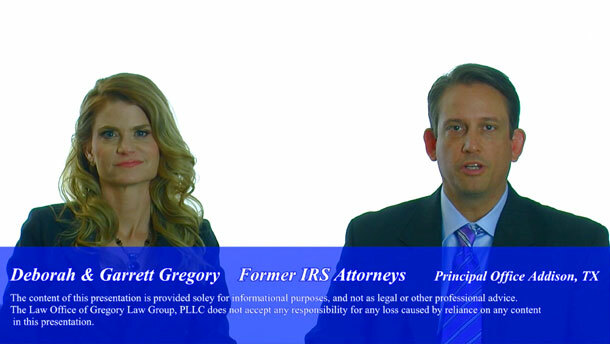 As former IRS Attorneys, Mr. and Mrs. Gregory worked with Large-Mid Size Business & International IRS teams on their audits and represented the IRS in Appeals. They reviewed, negotiated, and settled civil cases before U.S. Tax Court. They also provided legal advice on complex domestic and international tax issues to various IRS divisions. They have unique institutional knowledge of the IRS. Mr. and Mrs. Gregory understand the complexity of your IRS tax problems and will work hard to resolve your tax disputes with the IRS. • Business Tax Planning & Succession Planning. Very few law firms focus solely on tax defense and planning. Even fewer boast a founder who has the experience as former IRS attorney for 12 years. Call our office today at (888) 346-5470 and schedule a free consultation.